Our Toothfairy Truck promises "Overnight Delivery"- of course! Made in Vermont. 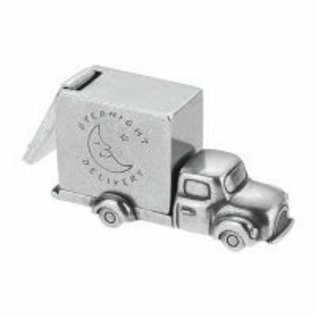 Our Toothfairy Truck promises "Overnight Delivery"- of course! The rear door opens to carry its pearly cargo to toothfairy land and returns holding the reward. Very convenient, yet we can't make guarantees about reliability; that's up to you-know-who! Measures 2 1/4" long, 7/8" wide and 1 3/16" high.